You don’t know how hard it is to see a common bird until you try to get someone else to see one. 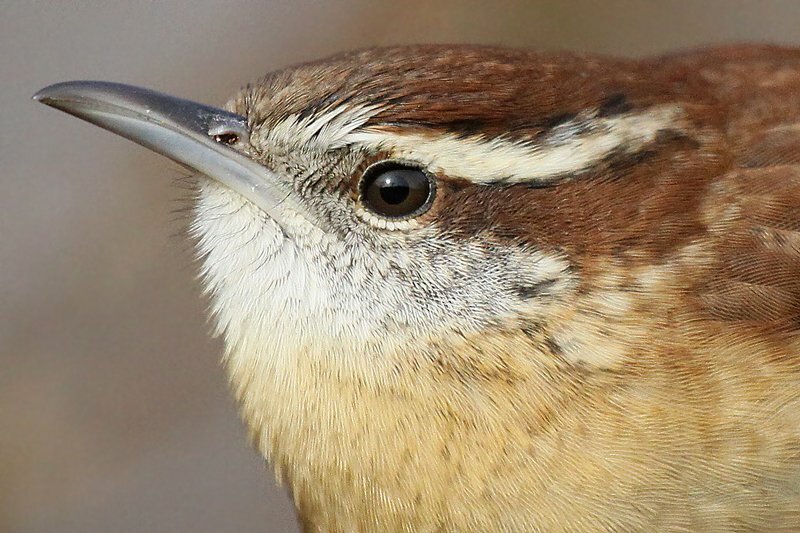 This is the lesson I learned at the Space Coast Birding and Wildlife Festival back in January when a young birder, Noah Kuck, let me know that he really wanted to see a Carolina Wren. He let me know this at the end of a field trip to Salt Lake Wildlife Management Area during which I had heard several wrens doing their “Teakettle Teakettle Teakettle” song but hadn’t really tried to get anyone on to one other than announcing that I heard one singing the first time I heard one sing. Because Carolina Wrens are common and easy to see, right? No one comes on a field trip at Space Coast trying to see a Carolina Wren! Well, no one comes on a field trip at Space Coast trying to see a Carolina Wren except for someone from North Dakota where, from what I can see in eBird, there have been three records of Carolina Wren ever. (There are almost undoubtedly other records that have not been put into eBird.) Anyway, I tried my best to get one for Noah at the tail end of the field trip but had no luck at all. The good news is that I was helping lead the Central Florida Specialties trip the next day and Noah had signed up for it which meant I would have another chance to show him a Carolina Wren, which is, to belabor the obvious, not a bird that is normally considered a central Florida specialty. Our chance came when we were at the Lake Marian boat ramp. Noah had just managed to find a Yellow-throated Warbler in the thick, swampy forest along the entrance road and there were several other passerine species around as well. (One of them was a Pine Warbler that I tried to convince everyone was a Bay-breasted Warbler because sometimes my brain doesn’t work right.) A Carolina Wren started singing and two others countersang. It should be no problem to get one to come out for a view, right? Well, maybe not right. I spished. I spished some more. I spished some more. None of the wrens showed the slightest inclination to come out into the open. I used tape. Sparingly at first. Then more tape. Then more. The damned birds wouldn’t show. Sure, one would sing occasionally but getting one to come out of the thick tangles in which they were hiding was impossible. Just when I was about to give up Noah excitedly exclaimed that he had one in his sight! Yes! I tried but couldn’t see it myself, not that I really wanted to see a Carolina Wren but because, on general principles, when you have worked for ten minutes to get someone a look at a bird you want to see it yourself. But it didn’t matter if I saw one at all. What mattered is that Noah finally got his wish. This Carolina Wren several years ago was extremely cooperative. Anyway, the whole experience got me thinking. 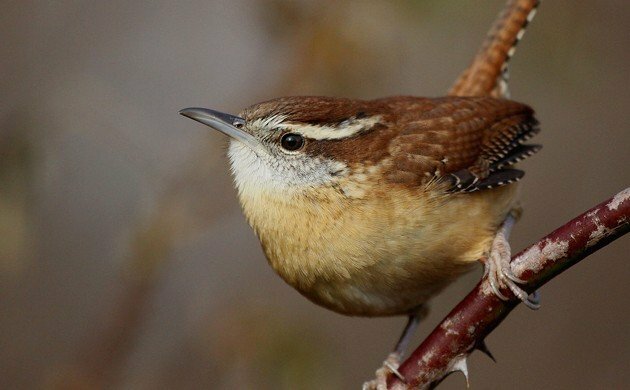 As a birder I have recorded hundreds of Carolina Wrens during my outings. The vast majority, I am sure, were heard-only birds added to my checklists because they are present and I want to keep accurate records. But I have never, since I first started birding, tried to see a Carolina Wren. And unless you have one coming to a feeder or it is spring and they are singing way out in the open as they set up a territory, they can be a very difficult bird to actually see. Then I started thinking about other birds that I consider common that could be very hard to show to another birder without making special effort. Have you ever tried to find a Hairy Woodpecker on the spur of the moment? What about a Swamp Sparrow? Sure, I can find these birds and some times of year they are very easy to see but even something like an Eastern Towhee can be very difficult to get a good look at, especially if you are not on your home turf where you know where every individual bird can be found. What are the difficult-to-see-but-exceedingly-common birds where you are? And can you show me one when I visit? Black Woodpeckers are the difficult-to-see-but-exceedingly-common birds where I am here in Heidelberg. They are easy to hear since their calls carry far, but due to their large territories, they can be difficult to see. Wild Turkeys are supposed to be very common and widely distributed in suburban New Jersey (to the point that they’ve been making the news), but I see them maybe once or twice a year. Getting someone a Fish Crow or an American Crow could be difficult if crows aren’t the mood to vocalize. Wild Turkeys seem to be entirely hit or miss. Which I imagine must make those who hunt them pretty nuts. And no shoveler in your home county? For shame! Albatrosses can be very tricky to pick up from land unless it’s very windy. Luckily getting a boat usually solves that problem. Also New Zealand Falcons. They’re around, and I see them relatively often these days, but I wouldn’t have a clue how to find one. They just turn up. Not a bird, but I recently had a guy from Pennsylvania join our company here in southern Louisiana. He really wanted to see an alligator. We were on an airboat going through the swamp and we didn’t see one alligator. I used to cringe in AZ when someone told me they really, really, really wanted to see a roadrunner. Common, conspicuous, hard to miss at many localities. Until you look for one. Mine is the Gray Catbird. I hear them a lot, but I have only seen one less than ten times, and I was working at getting a decent picture of one for months! Or the Yellow-Bellied Sapsucker, where I live anyways!